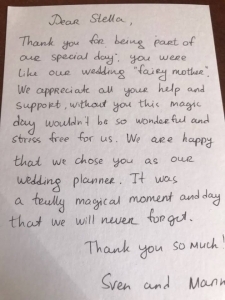 I chose Stella Virdi (Exclusive Weddings Cyprus) to be our wedding planner after doing some research online, and reading the fantastic reviews from previous couples. I sent a tentative e mail initially as it was a very small wedding party (just the two of us actually! ), and I wasn’t sure whether Stella would take on such a small job. 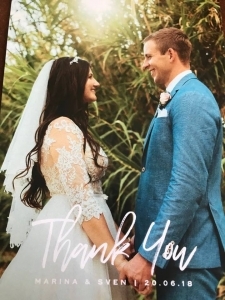 Her response was amazing – she reassured us that she would be delighted to work with us, and said that although she does work on very large and very expensive and elaborate weddings, she loves the small, intimate affairs just as much. We explained the sort of thing that we were after and Stella came back with several ideas for the venue. We chose Peyia, an old walled courtyard in the hills behind Paphos, and it proved to be an absolutely beautiful setting. Over the weeks and months before the wedding day Stella was in touch regularly. We sent her photos of us and a brief history as she was keen to get a feel for who we are, and this type of personal attention carried on throughout. 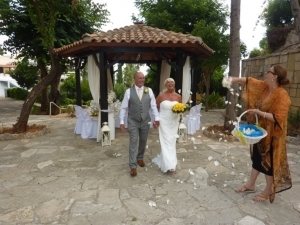 Stella advised us on the legalities and the documentation required to get married in Cyprus and she made things really easy for us. She also arranged a fabulous bouquet of yellow roses for me and a matching button hole for the groom, and arranged hair and make up appointments for me both I terms of a prior trial and the appointment on the day . I was delighted with both. After we arrived in Cyprus, Stella collected us from the hotel and took us in her car to the courtrooms sign affidavits and then to the town hall to apply for the wedding license. She has the bubbliest and most friendly personality and we loved her immediately. Nothing was too much trouble and we felt she was totally focused on our wedding day even though she had other weddings immediately previously and afterwards. She helped us plan out the day in terms of getting to the venue (I was concerned that my fiancé didn’t see me at the hotel, so he went first in a taxi and Stella came and collected me so that I met him there). She helped us with music for the ceremony and even brought fresh rose petals to throw as confetti. She also helped us decide where to go afterwards for champagne and where to eat later. We are both 60 years old and this was not our first marriages. We wanted secrecy (no one at home knew we were getting married until after we had flown to Cyprus) and intimacy, and Stella delivered in spades. We had the most fantastic and romantic wedding day, and it was just perfect in every way, orchestrated and arranged by Stella. We will be keeping in touch with her, and will be sure to meet her for dinner when we return to Cyprus next year. 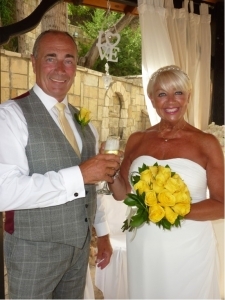 If you are planning a wedding in Cyprus please contact Stella Virdi – you simply could not make a better choice.